1'x1'x2" Panels / 96 sq. ft.
Studiofoam Wedgies are 1' squares of 2" thick Studiofoam and are a great solution for spot treating sound studios, home listening rooms, iso booths and more. With slightly more wedges per square foot than 2" acoustic Studiofoam, Wedgies feature maximized surface area for greater exposure to sound waves. 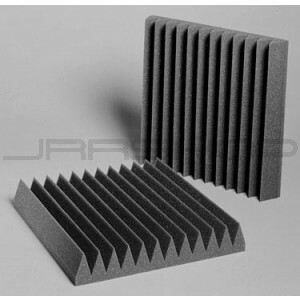 Studiofoam Wedgies are a great solution for small flutter echo problem areas and, when spread apart, yield beneficial sound diffusion off their exposed edges. A famous designer used Wedgies and called to tell us they were even more effective than he'd hoped they'd be, so you know you can trust them to tame your space! Wedgies are available in Charcoal Gray only! Coverage: 24 or 96 sq. ft.
Sugg. Adhesive: 1 Foamtak or Tubetak/24 sq. ft. or 1 Foamtak or 3 Tubetak/96 sq. ft.